At the start of each observing session, you should star test for problems that may change with transport of the telescope or a remounting of the optics after maintenance. This chapter will discuss the star-test pattern characteristic of one such warping and will present ways to relieve unusual stresses on the optics. Beyond the image improvements derived by giving careful attention to the deformations, you may be able to avoid catastrophic damage. Edge fractures are common among mirrors with too-tight edge clips. I have seen one mirror that was so severely strained that it broke in half. Imagine a mirror or lens as a thick circular chunk of gelatin. Because we don't ordinarily notice tiny deformations, we think of some materials as rigid, but all objects warp with pressure and temperature changes. An object that looks solid to unmeasured eyesight and touch becomes soft and pliable when we look at changes as small as a wavelength of light. Optics are rigid only in a macroscopic sense. If we place the gelatin on three support points, the shape of the surface distortion becomes a complicated function of the thickness of the slab and the placement of those supports. The problem is even more complicated if we tilt the gelatin; different supports carry unequal portions of the weight. Clearly, the edges sag between the support points. The supports underneath can be placed near the edges, causing the center to sag, or near the center, causing the edge to bend down. They can be placed at 70% the radius, which causes the least deformation, but a more complex one. We can split each prop into 3 or 6, but what tradeoffs do we have to make? That accounts only for the platform. What about the edges? If we screw on the edge supports too tightly, the surface pinches down around the three support positions. The clips could be properly adjusted, but when the telescope heels over, one clip may be forced to apply unusual pressure by the weight of the slab. Edge mounting has been solved a number of ways, ranging from the elegantly simple hanging-strap method used in Dobsonian mountings to a mercury edge-bag used in a few large equatorial reflectors. 1. They can be distinguished from turbulence because they are fixed patterns. 2. They often show 2, 3, or 6-fold symmetry. 3. They are usually weaker at high telescope elevations than low ones. 4. The pattern distortions may invert on passage through focus. Although more common in reflectors, optics pinching is not unknown in refractors. One refractor I examined suffered a problem with a coupling agent used between the lens element. The material hardened or bunched up in three locations, yielding a star-test pattern similar to the classic three-point pinched mirror cell. See Fig. 8-1. Fig. 8-1. Star-test pattern taken through a large refractor. Its three-sided symmetry betrays a pinching effect. When repairing this problem, the maker reported that the optical coupling agent was causing undue pressure on the lens. Also, lens cells have to be made a bit larger than lens elements to account for the more severe shrinkage of metal with cooler temperatures. Glass constricts, but it does not shrink as much as metal. If the cell is made too small, the optics can actually be squeezed at low temperatures, resulting in an astigmatic or otherwise deformed image. If temperatures drop too low. a tight cell can crack the lens like an egg. There are as many forms of surface warping as there are optical surfaces, but only one will be modeled here. The arbitrary choice will be clip pinching or perhaps a thin mirror that has too few bottom supports. What characteristics must the model have to simulate the effects of tight mirror clips? First of all, it must be strongest near the edge. If the optics deform, they can do so most easily at the edge. Second, the aberration function should have a tripartite symmetry. Optics, of course, can deform in other ways than the three-lobed pattern. However, since mounting cells usually have a three-sided aspect, such deformation is common. Without physical justification, one can choose a softened1 cycloidal dependence in angle and a third-order radial dependence to yield the aberration function shown in Fig. 8-2. The attractive feature of this pupil function is the asymmetry of the deformation; it ranges from creases in the valley to flat-topped humps. The aberration function could have been made symmetrical in the valleys and peaks, sort of like "three-lobed" astigmatism, but we will see astigmatic behavior later, so it would be redundant to dwell on it here. Fig. 8-2. An aberration function ofpinched or deformed optics. Figure 8-3 depicts the modulation transfer functions of two unobstructed pinched systems. Because the pupil function is not neatly symmetrical, the transfer varies with the angle at which we place the lines of the MTF target. The figure shows three transfer functions, corresponding to bar patterns at the vertical, horizontal, and 45° angles. The MTF for this particular surface deformation is very similar to that for defocusing. 1The form used was a "curtate" cycloid. See the Glossary. Fraction of maximum spatial frequency Fig. 8-3. 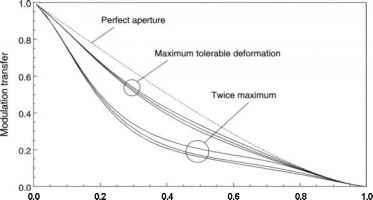 MTF degradation for three-lobed deformed optics. The least pinched curves of Fig. 8-3 yield a Strehl ratio of 0.8 (the same as 1/4-wavelength spherical aberration error). Because of the details of this aberration function, however, the total pinching aberration is 0.4 wavelengths. Doubling the total aberration to 0.8 wavelengths, the curve is stretched even further downward. At low spatial frequencies, such a telescope preserves contrast about as well as a perfect aperture of 60% the diameter. In Fig. 8-4, we see the star-test patterns expected from a warped reflecting telescope that has a 25% central obstruction. 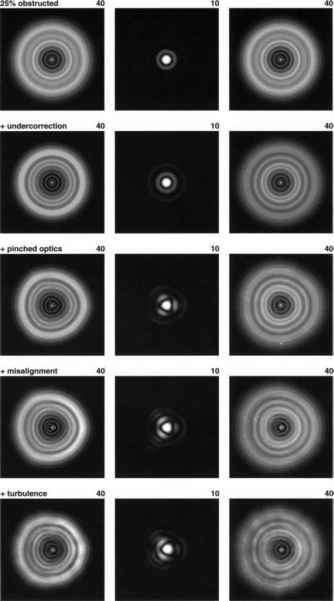 At focus, the diffraction rings are squeezed together into knobby radial spikes. Such perfectly balanced patterns will probably not be visible in real telescopes. One pressure point seldom induces precisely the same aberration as any other. Also, each deformed surface will display its own unique properties. One tricky pattern not handled by this model is a 6-sided spiking on one side of focus and a muted polygonal shape on the other. I witnessed this problem years ago when a mirror was screwed too tightly into a 9-point cell. Fig. 8-4. 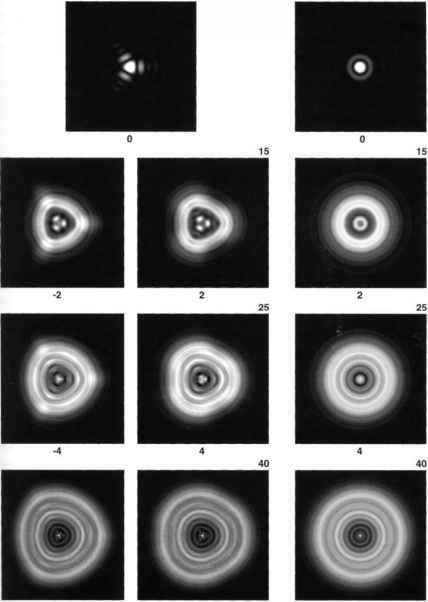 The star-test appearance of a deformed or pinched aperture of 0.4 wavelengths total aberration. Normal behavior is in the column to the right. Obstruction is 25%. 1. See if the warping changes with time. If it is a fixed, unchanging image distortion, it cannot be caused by local heating, tube currents, or atmospheric effects. Look again in 15 minutes. Air optics change dramatically; pinching does not (unless the squeezing changes markedly with temperature). 3. Shift the telescope to look at a star near zenith. The easiest confirmation that your difficulty is caused by mechanical supports is simply to change the direction of force on the optics. If the deformation lessens or changes, it could mean that the supports are warping the disk. In any case, it is rare not to change at least the magnitude, if not the flavor, of warping merely by changing the angle of the telescope. An exception is a pinched Schmidt-Cassegrain corrector plate. Because the plate is held so firmly, it gives the same distorted image at any angle. 4. Rack through focus. Some warped star-test patterns are similar to astigmatism on opposite sides of focus. If "points" in the image on one side become flat regions on the other, something could be straining the optics. Other deformations do not exhibit this behavior, however. It did not appear in Fig. 8-4, so it is not always a reliable indicator of pinching. The rest of the discussion will assume you have a reflecting telescope suffering from poorly held optics. Such a problem is rare in refractors, and you can do little about it anyway, except return the lens to the manufacturer for servicing. an easy way to isolate the problem to the offending mirror. Rotate the tube by 20° — 30°. If the deformation seems to be fixed at the same angle in the eyepiece, the problem is probably contained within the diagonal, because it rotated too. On the other hand, gravity has changed its direction with respect to the tube. If the pattern seems to have rotated by the same angle, or has otherwise changed, it is probably in the main mirror supports. Nowadays, the telescopes that are often in the most danger of suffering from warped optics are large, thin-mirror Newtonian reflectors. Tube angle cannot be changed in many such instruments, so you can't isolate the origin of the aberration by the simple expedient of rotating the tube. Fortunately, patterns seen in thin-mirror reflectors should change drastically with elevation. Try comparing the appearance of a defocused star just above the horizon with one nearly overhead. If the appearance changes markedly, the most suspicious support is the one carrying the most weight—the main mirror's. If the telescope is troubled by warping, you are better off to try mirror cell repairs blindly than to do nothing. First, you should verify that the mirror clips are not pressing down on the surface. Optimally, mirrors are not even held by such restraints. The purpose of mirror clips is to prevent catastrophic damage during transport and storage, acting as stops so the mirror does not fall face down in the tube. When the telescope is in operating form, these clips should hover above the surface. You should make sure that the side supports are slightly loose. In many mirror cells, the clips and the side supports are the same units. Since most mirror cells are made to fit a nominal-sized mirror, the side supports are somewhat adjustable, either using a plastic set screw or by adding thin shims to the clip mount. What you want to avoid is a situation where the mirror is held by excessive force, other than its own weight. One mirror cell I inspected a few years ago had too many shim washers removed from the combined clip and edge supports. This clip was attached with a screw, and the mirror was halting the screw before the metal of the cell did. In effect, the owner was tightening the side of the mirror down with a wrench. If the mirror rattles a little when you shake the cell, it is mounted properly. Try for less than 1 mm of motion in any direction and even less vertical travel. Thin, large mirrors in altazimuth Dobsonian mountings should not be held at the edge by point-like restraints. Their own weights induce unacceptable stresses. Thin mirrors should hang in a strap. But even if your mirror is held by a belt, it may still be maladjusted. 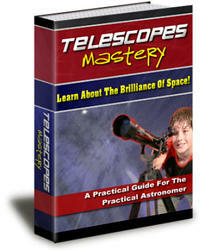 In one telescope I saw, the strap had slipped and the mirror was sitting on the side of the box. Also, the belt should never support more than 50% of a mirror's cir cumference or hold the mirror too tightly. Some mirrors are held with a strap that is tightened by a screw, similar to an automobile radiator hose clamp. Such mounting methods should be replaced or modified, because they squeeze the mirror excessively. Of course, few acceptable cell designs exist for large thin mirrors supported in equatorial mountings. As the instrument tracks across the sky it also executes a rolling motion. Thus, the direction of gravity changes orientation with respect to the cell. Besides the mercury bag solution mentioned earlier,3 makers have tried many other tricks to avoid undue pressure at points on the edge. The most common of these is gluing the mirror to the underneath supports, dispensing with edge holders and clips entirely. Even flexible aquarium cement occasionally suffers problems. Gluing the mirror down this way opens the possibility of other pressures being applied by deformed mounting plates. Perhaps you may be able to tune such a mirror to work properly in some areas of the sky, but most likely you will have to live with at least a little warping. Compromises are sometimes unavoidable when choosing to mount such a large, floppy mirror equatorially. 3 This method involves large amounts of toxic mercury, a procedure that can be used safely only by professionals. What is pinching of optics in telescope?